Sen. Bernie Sanders held a presser on health care at his Burlington office Monday morning before flying back to Washington and the budget battles ahead this week. 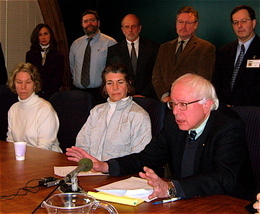 The folks joining him represented the seven Federally Qualified Health Centers, FQHCs, across Vermont. Five years ago there were just two, and the application process is currently underway for three more. FQHCs provide medical and dental care to Vermonters in need on a sliding scale. Sanders: "We are making progress in the state of Vermont. In the last five years tens and tens of thousands of Vermonters have access on a sliding-scale basis to high quality healthcare and high-quality dental care, and we are trying to move forward even further. Today we’re looking at Springfield and Windham County. We’re looking at Addison County. Within a couple years we hope to be down in Bennington County. "We’re gonna continue to fight to increase funding for the FQHCs so that the day will come, not only in Vermont but all over America when any person regardless of income will be able to walk into a high-quality community health center and get the health and dental care, mental-health counseling, low-cost prescription drugs that they need. That’s the point." Q. And when do you think that day might be, within 10 years? 20 years? And yes, Ol' Bernardo said he is voting in the presidential primary. Casting an absentee ballot before flying back to Washington on Monday afternoon. He'll vote in the Democratic Presidential Primary, but declined to say which candidate will get his vote. Sanders: "I am an Independent. I happen to think that the current administration will go down in history as one of the worst administrations in American history. They’re moving us in the wrong direction in almost every single area of public life. I hope our country will elect Barack Obama or Hillary Clinton as the next president. As an Independent I’m not going to be involved in the primary, but when the Democrats do select their nominee, I’m going to campaign as hard as I can to elect Obama or Clinton because I think this country must move in a very different direction." Mark this date : I agree with Bernie, more FQHC's are an excellent idea. They just need to make sure there billing practices are in order. HA JPC - - I will indeed mark the date! Whatever else you may say about Bernie he is very dedicated to improving health care for lower income people. And, he is the only one that I have heard that is really fighting hard to deal with the neglected issue of dental care for lower income people. FQHC's are a much more realistic idea then universal Health Care. The only thing that really needs to be pushed through is annual auditing to make sure what is being charged is correct. We could probably end up with enough FQHC's so that everyone has health care they can afford paid for by the overcharges to medicare/medicaid if the feds continue auditing. Remember to go VOTE !!!!!! Well, I didn't vote (in the primary, town meeting is another matter). I'm not a democrat. I'm not a republican. I don't like any of the major candidates. I don't see that any of them are likely to make the "real changes" needed. I guess I am stuck on the idea that we are going to be spending 300,000 million dollars on the F-35 jet fighters. Meanwhile, we destroy people's health and happiness due to our lack of a reasonable health care system and the myriad of other unserved needs. Will this lunacy ever end? Not with McCain, not with Clinton, not with Obama (who says in the "Audacity of Hope" that military spending is likely to increase in the short term). We do need a viable third party in this country. But we don't need another spoiler. How about a candidate that says, "support me, let's do a major campaign and fight for the presidency BUT if it is clear that I can't win, I will drop out of the race and not throw the presidency to someone all my supporters would oppose." "We do need a viable third party in this country. But we don't need another spoiler. How about a candidate that says, "support me, let's do a major campaign and fight for the presidency BUT if it is clear that I can't win, I will drop out of the race and not throw the presidency to someone all my supporters would oppose." The campaign you describe in your post is currently being used and it's called a primary. See: Ron Paul, Dennis Kucinich. On November 4, 2008 I propose that Ralph Nader stay home, cook a nice meal for Michael Bloomberg and Ross Perot while they watch the returns come in.